The past few years we’ve spent implementing derivatives reform. Firms purchased software, hired CCPs and participated in compression processes. This year, regulations will continue to become effective. Like, the new rules on Initial Margin for Bilateral (OTC) Derivatives were recently finalized. There are two good sources for information on the final margin rules: Sidley’s Derivatives Update dated January 20, 2016 has a summary and a PDF with details. If you’d rather read a concise overview, DLA Piper issued a press release here. With Initial Margin Rules final, let the training begin. On February 24, 2016, Derivsource published a blog by Olivier Grimonpont, “Dealers Prepare As Initial Margin Deadline Looms,” about the new margin rules coming into effect in September 2016. But what interested me even more were statements about silo structure versus the need to value chain training. Like a manna from heaven. The skies open, light streams through the clouds as angels hit that secret chord that David played and it pleased the Lord (random Leonard Cohen reference). I’m going to stop before Julia Schieffer invoices me for advertising. All kidding aside, I’m happy to see other Derivatives Service Providers echoing my views. The past few years, institutions have invested time and money implementing Dodd-Frank (Title VII). With much of the heavy lifting behind us, it’s time for Integrated (Value Chain) Training. Integrated Training is a blended learning program MHDS developed in response to client needs post-implementation. The goal of value chain training (as opposed to intra-silo training) are quicker problem-resolutions by double checking that proper redundancies are in place so each silo understands the impact of regulatory reform on their function. The trading book will receive checks against their own observation from interdealer brokers. But silos have a downside when it comes to hedging risk; risk isn’t viewed in aggregate until you reach the consolidated reporting level. One unit could be long physical gold, another unit could be short gold derivative contracts. Net, the company is flat, but if each unit operates independently, each position is managed separately. When wholesale changes are made to a business, impacting every part of the value chain, cross-function training is important so that each silo understands the changes made in their silo relative to other silos. An Institutions relationship with a new client (post Dodd-Frank) who will not be submitting trades to a CCP, will enter into Bilateral Contracts. The relationship begins in the derivatives area or in the origination areas (Debt & Equity Issuance, Bank Loans, Securitization & Project Finance). In either case, the Derivatives salesperson leads the charge by performing all of the required KYC and AML research before handing the client off to Legal, Docs & Credit to get the client setup to transact. MH Derivative Solutions, LLC offers clients a unique program that includes real-time examples and a blended learning process, which keeps participants interested while explaining the overarching changes of Dodd-Frank. Having grown up in the derivatives market, McCabe has seen the business grow, stumble and change. Having worked on both buy side and sell side, she understands their respective operations. This depth of experience means she knows the function of every silo along the derivatives value chain. The goals of Integrated (Cross) Training is that each silo has greater understanding of the entire value chain. Particularly since the derivatives value chain has changed completely since 2010, Integrated Training is essential for smooth operations throughout the value chain. The organization is still structured in silos and their reporting lines remain unchanged. The diagram below shows a typical derivatives workflow where Derivative Sales is the point person for derivatives with the client. Different organizations will have a different workflow. But generally, the salesperson is responsible for KYC (Know Your Customer) and AML (Anti-Money Laundering) regulations. A good senior salesperson is the first line of defense, protecting their institutions. But the Sales & Trading areas count on many other operational and technology areas of the institution. The depth of understanding of each individual’s role within the value chain helps institutions provide better service to their clients because each functional silo can incorporate other areas. Better-serviced clients are happy clients. And happy clients…DO BUSINESS! I wanted to give a hat tip to Derivsource and Mr. Grimonpont’s blog to illustrate like minds among derivatives service providers. It wasn’t meant to be a marketing pitch. But it sure does look like one. Well, if it quacks like a duck…make duck l’orange. While implementation continues, start educating all silos on new systems and workflow processes. 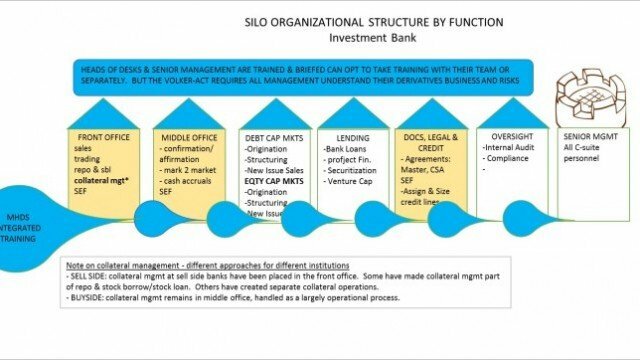 Since these systems reside in different silos, Integrated Training has also assisted firms to determine how they can get to Straight Through Processing (STP). By educating each functional area, they can troubleshoot problems quickly; ensure redundancies exist and be able to coordinate quickly as the regulators make changes in the future. Finally, it will give the more creative people the chance to resolve some of the remaining issues or disconnect still being handled by hand. It’s a win-win. Globally, Derivatives Regulatory Reform is uneven at best. It may be some time before the entire globe is working with the same margin levels and capital charges. Integrated Training is not static. Rather, it’s a dynamic process where new changes are incorporated as they become final. Well, that’s it for me. I’m going to go out into a glorious spring-like afternoon and enjoy the day and hope you do the same. If you’d like to know more about Integrated Training, contact MHDS. FOOTNOTE: Credit lines are an important part of a trading relationship. Even though initial margin will be posted and contracts will be marked-to-market daily, there is still counter-party risk – Concentration Risk, Key Person Risk, and Operational Risk to name a few.